Sloane Stephens was out of tennis for approximately 11 months because of a stress fracture in her left foot. While she was frustrated on the sideline, she was able to focus on her family, cheering at her little cousin’s soccer games, spending time with her grandmother who had recently suffered a stroke, and attending weddings and baby showers. The injury forced the 24-year-old American to withdraw from the 2016 U.S. Open and while she certainly kept busy — Stephens had a reporting/commentating stint for the Tennis Channel during Indian Wells, Miami and Charleston while rehabbing — it reignited Stephens’ passion for the game. She longed for the court. Stephens returned from her injury at Wimbledon in July, and turned a first-round loss to Alison Riske into motivation as she continues her meteoric rise through the rankings as summer has come to a close. Stephens, whose WTA ranking improved from as low as No. 957 to No. 83 entering the 2017 U.S. Open, is in the semifinals of tennis’ final Grand Slam for the first time. She faces No. 9 seed and two-time U.S. Open champion Venus Williams on Sept. 7. Following a disappointing straight-set loss at Wimbledon, Stephens lost in the Round of 32 at Washington, D.C., but earned consecutive semifinal appearances in Toronto and Cincinnati. Her semifinal appearance at the U.S. Open is projected to vault her into the WTA top 35, and she can get even higher should she advance to the final and/or win the tournament. Not only is Stephens’ success beneficial on a personal level, but also for women’s tennis in America as a whole. She is one of four American women (Venus Williams, CoCo Vandeweghe, Madison Keys) to advance to the U.S. Open quarterfinals; a feat that hasn’t been accomplished since 2002. It seems nothing is bothering Stephens at this point. Her foot feels good and she isn’t in pain. 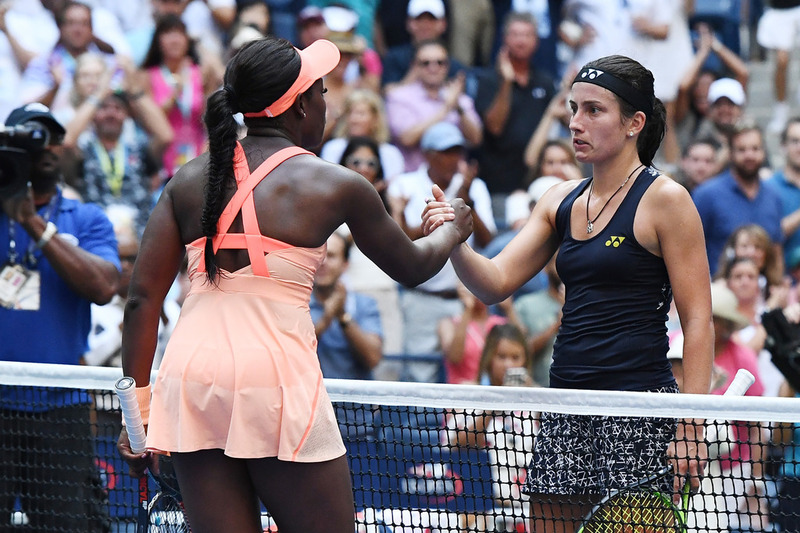 Her first time playing in Arthur Ashe Stadium took some time to get used to, but she controlled her emotions and fed off the pro-Stephens crowd. Well, there is one thing that can throw her off her game: bugs. Stephens had to evade a intruder at her press conference Tuesday, ducking out of her chair and brandishing her sneaker as protection. Remember being 12 years old and playing Little League baseball? More often than not, you played for a team named after a random MLB team that wasn’t your favorite. Games were held at the local field in town behind a strip mall. Your coach was a teammate’s dad. Andrey Rublev rarely looked like a teenager during his exciting run to the 2017 U.S. Open quarterfinals over the past two weeks at the Billie Jean King National Tennis Center in Flushing Meadows, N.Y.